This is an in–depth review of the one-a-day Ginkgo Biloba product manufactured by Thompson’s. This dietary supplement is supposed to increase cognitive function while also aiding memory and boosting alertness. The producer also claims that this remedy is useful in increasing concentration as well as maintaining proper peripheral blood circulation. Read on to find out more about this product’s ingredients and whether or not we believe them to be effective. Unfortunately, in spite of our in-depth research, we could not find a list of other ingredients. However, the manufacturer assures customers that the product is suitable even for vegetarian or vegan diets as it does not contain any dairy, corn, gluten, egg, nuts, lactose, shellfish, peanuts, soy, fish, sesame seeds or sugar. This dietary supplement also has the advantage of not containing artificial coloring or other flavors. Adults should take one capsule a day as a dietary supplement. The capsules should preferably be taken during a meal. The label advises against exceeding the recommended dosage of one capsule per day. The producer does not clearly mention any possible side effects. They do advise against mixing this supplement with other prescription drugs or even taking it before surgery. If the customer does not notice any improvement in his condition after taking the remedy, he is advised to see his physician. Probably the most peculiar thing about this dietary supplement is the fact that the manufacturer does not offer a price on the product’s official webpage. There are some links that lead to various distributors and pharmacies, but after quite a time-consuming search, we were still unable to learn how much a bottle of this product costs. The only available information offered by the manufacturer is the fact that one container has 60 capsules, which basically is a two month supply of the product. One of the most concerning things about this remedy is the fact that it comes with virtually no guarantee. This lack of a guarantee raises some serious questions regarding the quality of the ingredients and overall effectiveness of the product. What’s more, the product’s official webpage also seems to completely lack customer reviews. 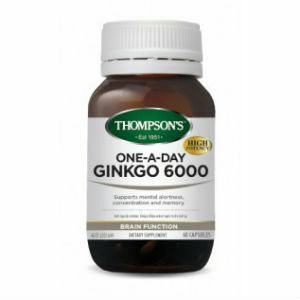 One of the good things about one-a-day Ginkgo Biloba manufactured by Thompson’s is the fact that it’s safe to use even for vegetarians and vegans. The all natural ingredients that seem to come in adequate concentrations are also a plus. However, the fact that customers need to jump through hoops in order to find the price of this remedy is definitely a drawback. Add that to the missing guarantee and the missing customer reviews and you might want to reconsider this purchase. Click here to learn about our Top Brain Boosting Nootropic Supplements. Henry Costa	reviewed Thompson’s One – a – Day Ginkgo Biloba	on November 16th	 and gave it a rating of 2. Copyright © 2019 Brain Center- All Rights Reserved.